Seabird is designer Billy May's vision for a phone that aims to address some of the frustrations people have when interacting with small devices. "While mobile CPUs, connectivity and development platforms begin approaching that of desktops, the lagging ability to efficiently input information has grown ever more pronounced," he wrote in a blog post describing the phone. The post includes videos--one in 3D--with a rendering of the concept phone. Seabird has two pico projectors. When placed in a dock it uses one of them to project the screen on a nearby wall for easier viewing and the other to project a full-size, virtual keyboard on the table where it sits. A user can then type on the virtual keyboard instead of a tiny on-screen or physical keyboard on the phone. The dual pico projectors, located on the sides of the phone, could also be used without the dock to project half a keyboard each -- one on each side of the phone. "The Seabird, on just a flat surface, enables netbook-quality interaction by working with the projector's angular distortion to deliver interface, rather than content," May wrote. 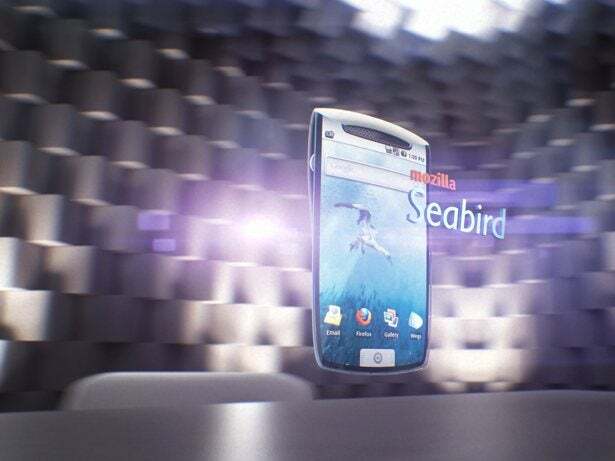 Seabird features other standard smartphone components like an 8-megapixel camera, a 3.5-millimeter headphone jack and a mini-USB port. May envisions that it can be charged wirelessly. May came up with the idea as part of Mozilla Labs' Concept Series, which challenges anyone to develop concepts around browsing and the Web. While Mozilla says it has no intention of developing a phone like it, the technologies in it are either already available or not terribly far-fetched.